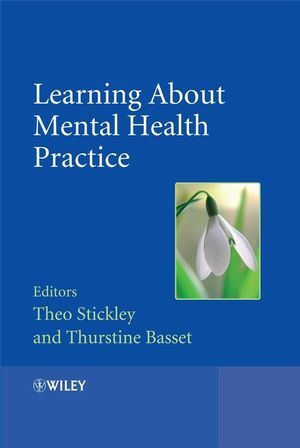 This textbook outlines the key areas of mental health practice for those in the early stages of their training, who may not necessarily come from psychology backgrounds. Theo Stickley trained in counselling and mental health nursing, and practised in both professions for many years. he now teaches mental health at the University of Nottingham and has published widely in the nursing and mental health press. The focus of his research projects in collaboration with people who use mental health services. Theo is a keen gardener, motorcyclist and artist (but has not yet found a way to combine all three simultaneously). Thurstine Basset trained as social worker and worked as a community worker and social work practitioner, mostly in the mental he4alth field. he is now an independent training and development consultant and runs his own company, which is based in Brighton. He works for national voluntary agencies, such as Mind, Together and the Mental Health Foundation. With the Richmond Fellowship, he is the joint course leader for its Diploma in Community Mental Health, which is accredited by Middlesex University. He is a Visiting Fellow at the University of Brighton. He has written mental health learning materials, many of which are published by Pavilion Publishing, with which he works in an advisory role. He likes to walk and watch cricket. Introduction (Theo Stickley and Thurstine Basset). Part I: Foundations For Mental Health Practice - The ten Essential Shared Capabilities. 1. The ten essential shared capabilities: their background, development and implementation (Roslyn Hope). 2. The ten essential shared capabilities in practice (Ian McGonagle, Ian Baguley, Sara Owen and Sarah Lewis). 3. Working in Partnership (Anne Beales and Gary Platz). 4. Respecting diversity through acknowledging, valuing and using diversity and challenging inequalities (AVUDCI) (Premila Trivedi). 5. Practising ethically: values-based practice and ethics - working together to support person-centred and multidisciplinary mental health care (Bill Fulford and Kim Woodbridge). 6. Challenging inequality (David Pilgrim). 7. Promoting recovery (Daniel B. Fisher). 8. Identifying people's needs and strengths (Lesley Warner). 9. Providing service user centred care (Laura Lea). 10. Making a difference (Norman Young, Madeline O'Carroll and Lorraine Rayner). 11. Positive risk taking: a framework for practice (Anne Felton and Gemma Stacey). 12. Personal development and learning (Sharon Lee Cuthbert and Thurstine Basset). Part II: Issues For Mental Health Practice. 13. Social perspectives on mental distress (Jerry Tew). 14. Socially inclusive practice (Peter Bates and Joanne Seddon). 15. Equality and rights: Overcoming Social exclusion and discrimination (Liz Sayce). 16. Service user involvement (Peter Campbell). 17. Connecting the parts to the whole: Achieving effective teamwork in complex systems (Steve Onyett). 18. Problems associated with the use of the concept mental illness' (Anne Cooke). 19. Drugs, alcohol and mental health (Tabitha Lewis and Alison Cameron). 20. Gender inequality and the mental health of women and men (Jennie Williams and Joe Miller). 21. The trauma model of psychosis (Paul Hammersley, Peter Bullimore, Magdalen Fiddler and John Read). Part III: Approaches for Mental Health Practice. 22. Carers' experiences of mental health services views about assessments: Lessons from the Partnership in Carer Assessments Project (PICAP) (Julie Repper, Gordon Grant, Mike Nolan and Pam Enderby). 23. Therapeutic relationships (Theo Stickley and Dawn Freshwater). 25. Employment: What you should know and what you should do (Bob Grove). 26. Treating creatively: the challenge of treating the creative mind (Peter Amsel). 27. Social inclusion and psychosocial interventions: Clash, compromise or coherence (Peter Bates and Julie Cullen). 28. Spirituality and mental health (Peter Gilbert). 29. Holistic approaches in mental health (Jan Wallcraft). 30. The capable practitioner of the future (Theo Stickley and Thurstine Basset).